More than 35,000 troops are participating in NATO’s month-long Trident Juncture war games, along with some 140 warplanes and 60 warships. The militaries of 30 different capitalist governments aligned with the NATO alliance are involved. Massive NATO drills are taking place in Italy, Spain and Portugal. The drills are designed to prepare the NATO powers for large-scale strategic warfare outside the boundaries of the NATO countries, according to NATO officials. The main focus of the NATO drills is to prepare for comprehensive strategic warfare spanning broad stretches of the Eurasian landmass, comments from NATO officers have made clear. “Trident Juncture 2015 will demonstrate NATO’s new increased level of ambition in joint modern warfare and will showcase a capable, forward-leading Alliance,” NATO’s command center said in a statement Tuesday. According to NATO officials, the military drills involve an unprecedented mobilization of NATO forces, modeled on the “Federated Mission Network” system of military “interoperability” developed during the US-NATO occupation of Afghanistan. The exercises are emphasizing large-scale maneuver warfare to a degree not seen since the dissolution of the Soviet Union, but will also include training in hybrid warfare. The drills aim to mobilize NATO’s leading combat elements, including the NATO Response Force (NRF) and the Very High Readiness Joint Task Force (VJTF), for a “changed security environment” and “challenges from the South and the East,” according to NATO statements. The Western powers are preparing their militaries for a further destabilization of Europe’s political order and for new wars and interventions along Russia’s eastern frontier and in Africa, the Middle East and Asia. He cited both the large Russian naval base at Kaliningrad, an enclave of Russian territory wedged in between Lithuania and Poland, and the recent deployment of Russian warplanes to Syria, on the southern flank of NATO member Turkey, as developments that NATO planners had to take into account. During the news conference, an antiwar protester unfurled a banner demanding an explanation of the bombing of a Doctors Without Borders hospital in Afghanistan, a war crime committed by US military forces with the backing of their NATO partners in that country. There were other antiwar protests in Trapani, Sicily, where the Trident Juncture headquarters was established. Breedlove was echoing the pledge made by President Obama during his last trip to the region: the full power of the 30-nation alliance, including its nuclear armaments, would be mobilized for the defense of any member nation, including the Baltic states, Estonia, Latvia and Lithuania, which have perpetual tensions with Russia because of the large Russian-speaking minority in each country, which is either persecuted or openly disenfranchised. The Trident drills are part of the general military escalation against Russia carried out by the US and NATO powers since the toppling of the pro-Russian regime of President Viktor Yanukovych by the February 2014 US-backed and fascist-led coup d’etat. The intervening period has seen the steady expansion of the NATO Response Force and the pre-positioning of NATO forces on high alert to deploy to the Russian border within a matter of hours. On Sunday, US General Dennis Via said that the Pentagon is preparing to ship another round of pre-positioned weapons packages known as “activity sets” to Europe. The Trident drills are also serving to prepare NATO forces for operations along the southern flank of Europe. Faced with the surging tide of refugees crossing the Mediterranean in flight from the catastrophes produced by the US-NATO wars in Libya and Afghanistan, the US occupation of Iraq, and the US-backed Islamist campaign against the government of Syria, which have killed hundreds of thousands and left entire societies in ruins, the NATO powers are mobilizing their military might to beat back the tidal wave of human beings produced by their own criminal war policies. 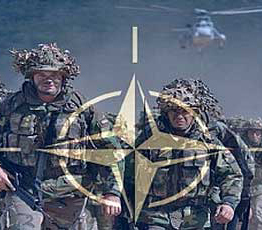 The intensity of the NATO war games is an expression of the fact that a general war in Europe is now viewed as possible, even likely, by leading factions of the Western militaries. Comments from a French military officer featured in a NATO promotional video for Trident Juncture illustrated the militarist mentality that prevails within the imperialist officer corps. The war fever of the imperialists must be taken as a grave warning to the international working class. Unthinkable scenarios are being discussed in ruling circles, which involve the unleashing of full-scale war between the two major nuclear-armed forces on the planet, NATO and Russia.